Update, November 4th: A second volunteer day has been scheduled for today — Sunday, November 4th, beginning at 9AM. Volunteer Relief Opportunities during the week at FEMA Distribution Site, National Guard Distribution Site, Coney Island Generation Gap on Neptune Avenue and at Sea Gate. 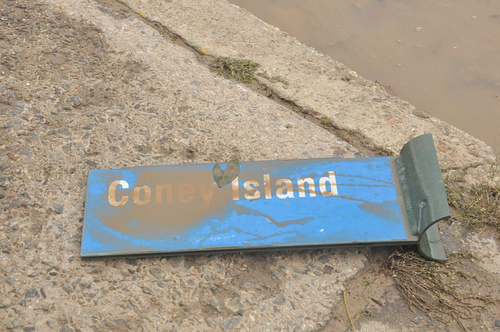 For updates on volunteering or donating to help Coney Island, or to get help, visit coneyrecovers.org. Volunteers are needed to assist in recovery and cleanup in and around Coney Island. When: Saturday November 3, 9:00 A.M. Dress warmly, wear sturdy footwear or boots, and bring work gloves! Bring your own flashlight (with extra batteries), a backpack, and snacks/water for yourself for the day. Please note that bathroom access on site will be very limited. You can refer to MTA.info for latest transit updates. Carpooling and biking are encouraged. Please forward this to all of your networks. At 12 noon, CIBBOWS (Coney Island Brighton Beach Open Water Swimmers) and the Coney Island Polar Bears are also teaming up for a beach cleanup. “Meet us at the Municipal Parking Lot in Brighton Beach (Brighton 4th Street and Brightwater Court) at noon on Saturday and help us clean-up Brighton Beach and Coney Island,” says their Facebook invite. If you are unable to make it on Saturday, stay tuned for more volunteer opportunities. Coney Island from Brighton Beach to Sea Gate was devastated by Sandy and the rebuilding will go on for months. 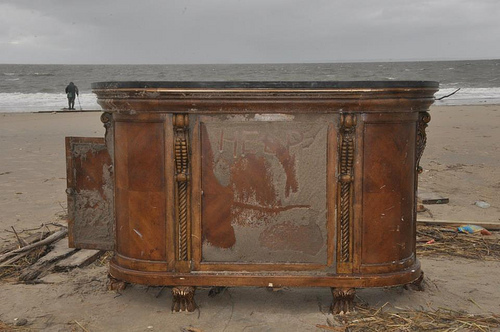 The surreal photos in this post were taken by Coney Island resident Mindy Gress on the day after Hurricane Sandy. 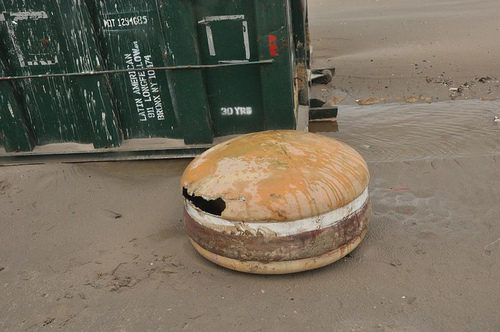 ATZ is issuing an all points alert for a giant fiberglass burger last seen abandoned by a dumpster on West 15th Street. Looks like Sandy took a bite out of it. It belongs to Mama Burger, the A & W root beer figure on the roof of Paul’s Daughter, who was recovered after being toppled by the storm. Mama wants her burger back! Perhaps it will turn up during tomorrow’s Coney Island Cleanup.